After cradling the little girl (bunny) for a while, the Bunny Queen escorts her to a land of eternal summer, where her mother is cooking in the kitchen, and one perfect tomato is ripening in the garden, perfect for First Tomato soup. I could use a big bowlful of First Tomato soup these days. How can I be sure it’s a tomato??? Well, how do I recognize my own children when I see them in the street? If I could have nibbled it, I would have (as with all nightshade family vegetables, tomato leaves are toxic - beware!) – the smell was at once so familiar and so distant, a message from some far-off bunny planet. A bunny planet where I grew tomatoes. A bunny planet where I could pinch and prune and tend my tomatoes to my heart’s content (and sometimes beyond). 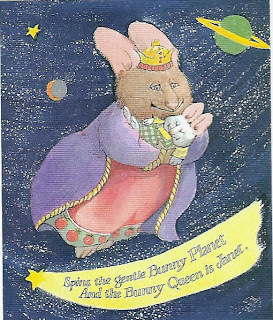 I think every oleh must have a bunny planet – somewhere they miss, that exists for them now only in fantasy in the midst of their saddest, loneliest and darkest days.